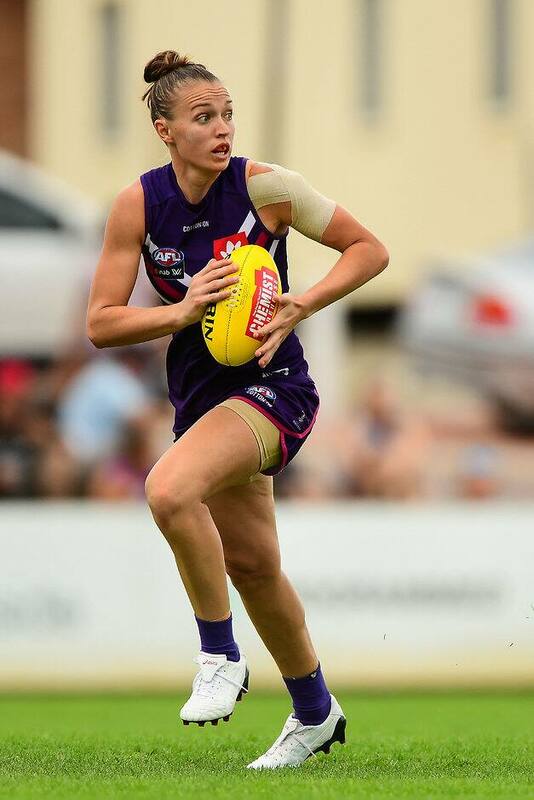 TWO OF Fremantle's star NAB AFL Women's players will be sidelined for most, if not all, of the WAWFL season. Captain Kara Donnellan has been forced to cool her heels on the sidelines at Swan Districts until the 2019 NAB AFLW season after having clean-out operations on both knees. Dockers best and fairest Ebony Antonio had minor surgery on her Achilles but is hoping to play a few games towards the end of Swan Districts' season, especially if the team qualifies for finals in September. Speaking to the Chicks Talkin' Footy program on Joy FM, Donnellan and Antonio said they were yet to start running but have been taking statistics and running the rotations board for the Swans. "I'm being kept on ice, just to [be able to] kick off pre-season. I'm being looked after quite well, but hopefully Ebony will get a few games in," said Donnellan, who also is the Swans’ women’s team secretary. "It's quite hard for us sitting on the sidelines and not being out there helping our teammates, but in the scheme of things, I think we're doing quite well. The young kids who have come up from youth girls are performing really well, and at the end of the day, that's what you want." After consecutive seventh-place finishes in injury-decimated seasons, Fremantle has a new coach with West Australian under-18 girls' coach Trent Cooper taking the reins from Michelle Cowan, who resigned at the end of the season. "I've had a little bit to do with him at Swan Districts. Myself and Ebony did a couple of pre-season training sessions with him over the years when he was coaching the (WAFL) colts," Donnellan said. "He's a fantastic bloke, really passionate about his footy. He's been involved in the women's game at a state level for the last couple of years, so I'm really excited to see how he's developed and grown since training underneath him. "I'll catch up with him for a coffee and start planning where we go, but I'm excited to see what he brings to the footy club. [It’s] a breath of fresh air really, and I think the girls will really respond to him." Donnellan and Antonio are the "power couple" of the AFLW, with the pair getting engaged in April. They are aiming to get married towards the end of next year. They spoke about the importance of ‘Pride’ matches held across the country and aimed at LGBTQI+ inclusion and acceptance, and what impact the games have had. "Being accepted in the football and wider community makes everything a lot easier," Donnellan said. "Not that we'd stop playing if we didn't have the support, but I think it's really great it's now recognised. "We've got the platform playing AFLW now to be at the forefront and voice our opinions about current issues and things we face every day, unlike people in the wider community who don't have the platform or opportunity,” she said. "It's very comforting to know you've got the support to not only play the game you love, but also to know no matter who you love, you're supported." The Western Bulldogs and Carlton played a Pride match in the AFLW competition earlier this year, while St Kilda and Sydney participated in one at AFL level in round 12. Antonio would love to see all clubs get involved in the initiative. "I've never been involved in a Pride game. I'd love to see a Pride round next year, not just the Bulldogs and Carlton having the opportunity to wear the (rainbow) colours. I'd love everyone to jump on board,” she said. "It'd be pretty phenomenal, and something I'd question of Freo. Why couldn't we do it?"